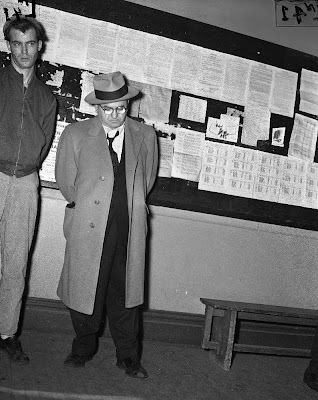 Caption reads: Nate Treger, tavern manager of The Double Door at 1126 Argyle Avenue, in Shakespeare Police Station on January 19, 1957. He was questioned by police about the Day murder investigation. When researching the address to see what else might have been here besides the Double Door, I found a 1909 reference that the address was a delivery station of the Chicago Public Library. "The public library is free to all residents of the city. Books may be borrowed for home reading either at the main building downtown or at any of the various delivery stations. The only requirement is that the borrower must furnish a certificate signed by a property owner guaranteeing the library against loss. At the close of September, 1909, the public library contained 369,247 volumes. The aggregate circulation for the year ending May 31, 1909, was 1,777,142 volumes, which does not include the use of books kept on the open shelves at the main library or its branches or the periodicals or newspapers used in the reading rooms." Today, the address is one of two locations for QIdeas, where you can buy serving ware at wholesale prices..